Get your driving lessons in Wokingham discounted if you book 10 hours, click the request a call back button and one of our local instructors will call you back and answer any questions you may have. Always indicate correctly and in good time, this helps other road to know your intentions. When reversing, keep looking round for road users. Never continue reversing as another road user is passing. Use your mirrors before you change speed (up or down), change gear, stop or move off and whenever you change direction in your driving test. All our Wokingham Driving Instructors follow our driving instructor code of conduct. with one of our local driving instructors who are trained in the latest coaching and client cantered learning skills. We have a very high success rate for the driving test in Wokingham and we can help you to become a very safe driver. 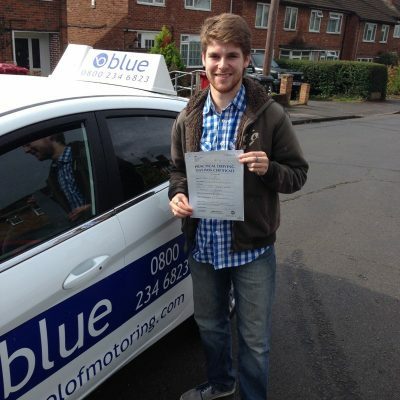 Blue School of Motoring instructors in the Wokingham area have a high success rate, with most of our students for the driving school coming from recommendations.